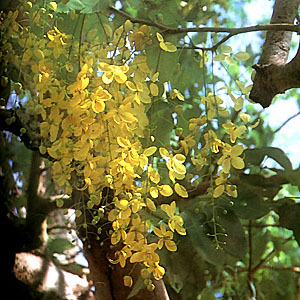 Kanya Pistula – Scientific name: Cassia fistula L.
Moderate-sized, erect deciduous tree. Leaves are pinnate, smooth, 30-40 cm long. Leaflets are ovate, 8-16, about 10 cm long. Flowers are fragrant and bright yellow; borne in long, lax racemes, 30-50 cm long. Pod is cylindric, 30-60 cm long, about 2.5 cm thick, dark brown, pendulous, smooth and shiny. Seeds are numerous, embedded in black, sweet pulp. Found in northern Luzon to Mindanao. Cuultivated as an ornamental flowering tree. Tannin; saccharose, 53-66%; invert sugar; citric acid; coloring matter; pectin; anthraquinone. Ringworn and other fungal skin infections: Grind leaves into a paste and rub on affected parts. Laxative: Eat pulp of ripe fruit (4-10 segments). Powdered leaves are also laxative. Roots are given as a tonic and febrifuge; also, a strong purgative. Flowers are demulcent and laxative.